Born in Mt. Sterling, Ohio. Graduate of Ohio State University, B.A. Degree, 1916. L.L.B. Degree 1920. Honorary doctorates, Ohio Northern, Ohio Wesleyan, Ohio State Universities. 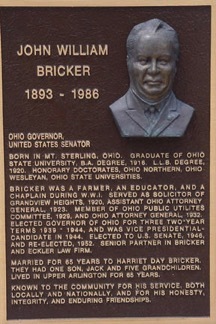 Bricker was a farmer, and educator, and a Chaplain during W.W.I. served as solicitor of Grandview Heights, 1920. Assistant Ohio Attorney General, 1923. Member of Ohio Public Utilities Committee, 1929 and Ohio Attorney General, 1932. Elected governor of Ohio for three two-year terms 1939-1944. Elected to U.S. Senate, 1946, and re-elected, 1952. Senior partner in Bricker and Eckler Law Firm. Married for 65 years to Harriet Day Bricker. They had one son, Jack and five grandchildren. Lived in Upper Arlington for 65 years. Known to the community for his service, both locally and nationally, and for his honesty, integrity and enduring friendships.